The C-119 Flying Boxcar was a US military transport airplane that was developed from the Fairchild C-82 Packet during the Second World War. It served various roles such as carrying personnel, litter patients, cargo, and mechanized equipment; and dropping cargo and troops that were aided with parachutes. The very first C-119 Boxcar had its maiden flight in November 1947. 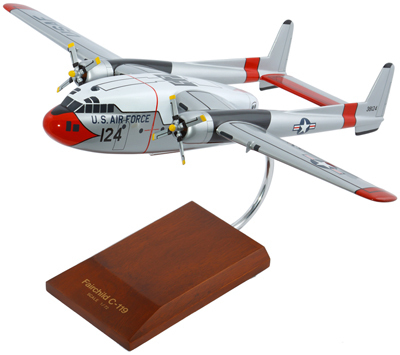 When production had been concluded in 1955, more than 1,100 models of the C-119 had been made. It earned the moniker ‘Flying Boxcar’ because of its unusual appearance and its cargo-hauling capacity. It has a distinctly large fuselage pod and straightly designed wings with twin fins. It was embedded with R-4360-20 radial engines, each having a horsepower of 3,500. Indeed, the C-119 had earned the reputation of being a classic, versatile, and robust airplane for a time. If you have always been fascinated by the Korean War, this aircraft replica will surely bring notable memories from that period which has resulted to the creation of the two Koreas. Have one today and be reminded of man’s victories and defeats as seen through the skies.